The rebec is considered the first bowed instrument to reach widespread acceptance throughout medieval Europe. Aside from being the catalyst for some of the most brutal battles in history, the early crusades offered much in the way of cultural exchange. 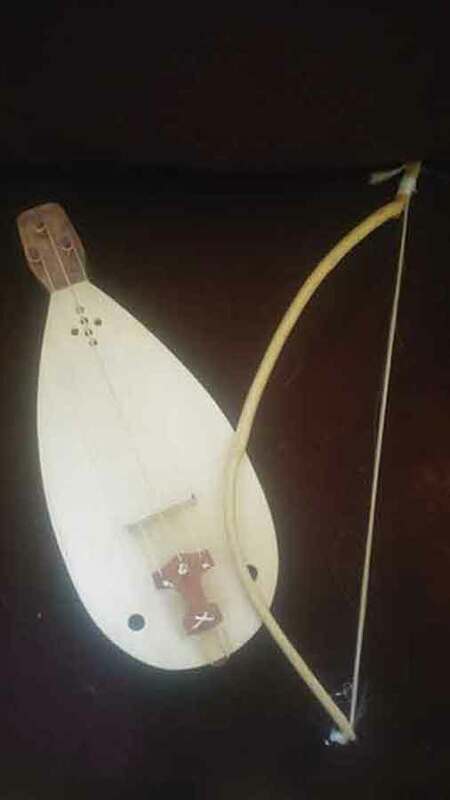 Going back to pre-Christian history, one of the most common instruments in the Middle East was the spike fiddle, usually an organic resonator (gourd, tortoise shell, etc.) fitted with a skin soundboard and transfixed on a stick. A tuning key on the end and one string over a bridge made for a simple fiddle known as a rabab. These small fiddles were common souvenirs of the returning crusading knights. European builders had little to no tradition of organic building, but they were quite skilled at wooden instruments, so it was natural that they created an instrument mimicing the rabab but built in their own manner. This instrument was known as a rebec. WIth a simple flat soundboard, flat to lightly curved fingerboard (the curve increased as time passed), and a flat to lightly curved bridge, the rebec became over time a favorite courtly instrument. By the fourteenth century, the rebec family had been developed, with 4 different sizes tuned in fifths from each other. This string consort served as the chamber performance strings ensemble until the viol replaced it in that role in the sixteenth century. We base our instruments on archaeological evidence, historical art and written documentation, but we do not replicate these instruments. Instead, we choose to take what we know from these sources and our own experience, mix in the imagination of the customer, occasionally add in a drop of technological magic, and create what a rebec builder of this era would have created, a unique piece for his client. So drop us a message or give us a call. We promise, we won't charge to answer your questions. This diminutive instrument was likely the first native Western European fiddle. The unfinished bowl, with a tailpiece hole but no indication of a mounted soundboard or even sockets for tuning keys, was found in the 10th century layer at Hedeby, a viking industrial settlement in northern Germany. The remains pose more questions than they answer, but applying some reverse engineering from the 12th century Guduk from Novgorod, and an understanding of the type of music played during this period, I have decided on a 3 string drone fiddle configuration that will cover the range of other instruments of the time and be consistent with manufacturing processes for strings and woodwork. Played much like a Jouhikko, this instrument has a sound bigger than it's size. . The soprano rebec was the highest pitched, eventually fitting a standard tuning equivalent to d, a, e or the top three strings on a violin. The next, and possibly most common size, was the alto, tuned a fifth below at g, d, a. This little fiddle was most often the solo instrument. The two lower range instruments in the family were the tenor and the bass rebecs. The tenor was tuned c, g, d like the bottom three strings of a modern viola. The bass was tuned a fifth lower, to f, c, g, which has no corresponding modern viol tuning. This family did not have the range of the modern viol family, instead having a family range only a fifth larger than a modern five string viola. It was, however, the most popular family of bowed strings for centuries, the soprano / alto combination 4 string rebec evolving into the concertmaster's Kit, or Pochette..